This ITALIAN CHOP SALAD has so much flavor! It’s tangy, filling and delicious! I’m glad it’s January. I do miss Christmas and all the holiday fun, but that month is stressful! All the shopping, cleaning, cooking, planning, wrapping, organizing and eating. I’m so tired of all the eating. I know they say you gain 5 lbs over the holidays, and I think I gained all of those 5 lbs. Time to hit the gym and eat better foods! In January, we all try to make healthy food choices. The new year is full of smoothies, salads, whole grains and healthy soups. I know, it’s not quite as fun as December’s appetizers, dips, and cookies! While this recipe IS a salad, it is still pretty fun, and it’s delicious! 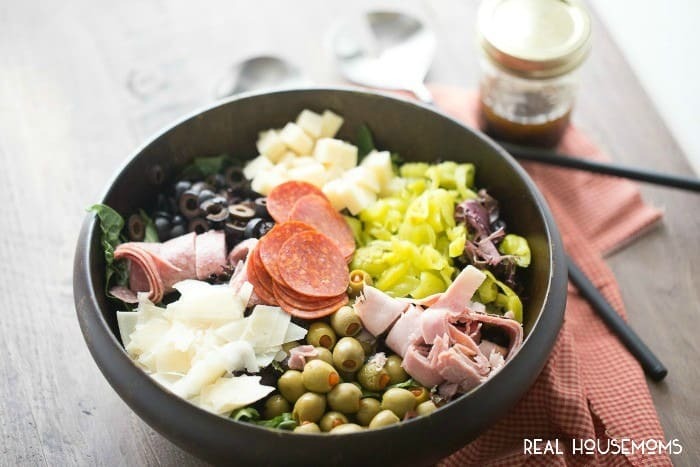 This chopped salad has a little bit of everything; it has fresh, crisp lettuce, tangy olives and pepperoncini peppers, two kinds of cheese and deli meats. A simple balsamic dressing gets drizzled over top. This salad is so good and so filling; it’s more like a meal than a salad! One thing to note about this salad, is it’s rather versatile. 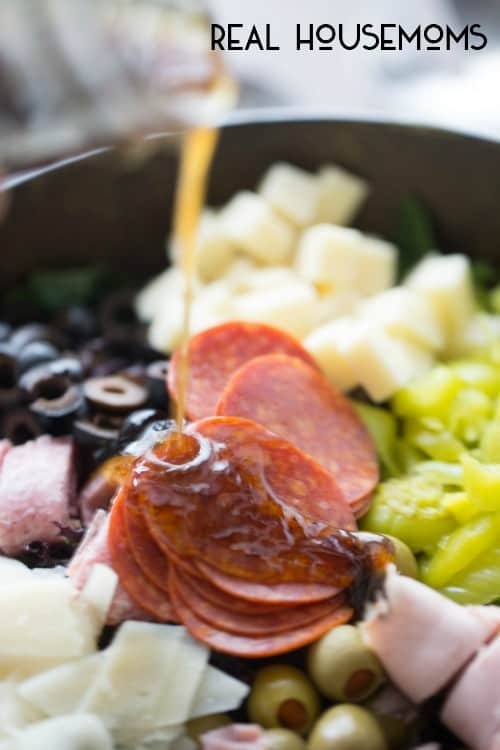 You could interchange the ingredients if you’d like; swap out the deli meats and use turkey or roasted chicken instead. You could use any cheese you have in your fridge and add more veggies if you’d like. This salad really does make a great main meal, but since it makes so much, it would be a great side salad for a dinner party or to share with friends. Finally, the dressing would really be good on any salad you can create. If I can eat like this all through 2016, then when next December comes around, I’ll be ready to dive into all the cookies with little regret! 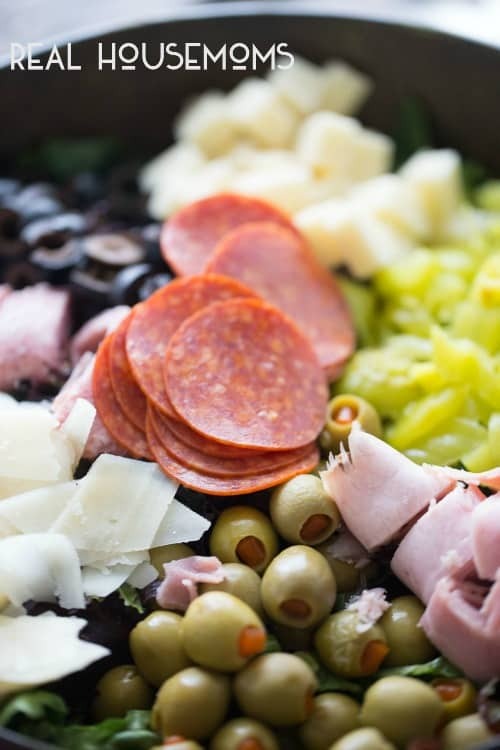 This Italian Chop salad has so much flavor! It's tangy, filling and delicious! Place lettuce in a large bowl. 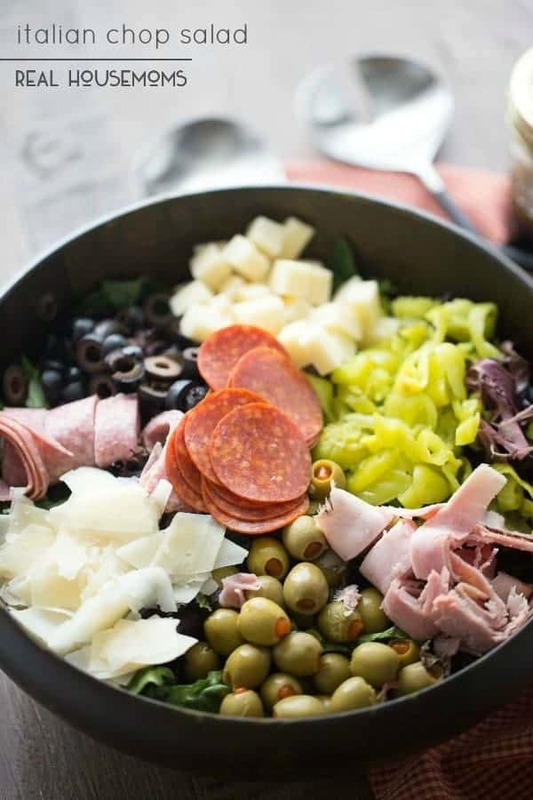 Top with both olives, peppers, deli meats and cheeses. Place dressing ingredients in a plastic container; cover with a lid and shake until combined. Pour over salad. Serve.